Tasty Dumplings is a classic favorite of our family especially for its famous Porkchop. The big and flat porkchop is their house specialty. I think every customer who goes in the restaurant orders their porkchop rice/noodles. I don't eat porkchop quite a lot because I find it tough to chew. 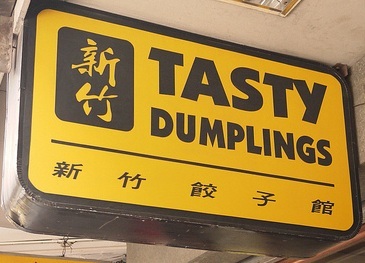 But thanks to Tasty Dumplings, they invented a way to make porkchop tastier and juicier! By pounding them as thin as pancakes. Yes, this is not the usual thick and juice-less porkchop we eat at home. Just by looking at it, you'll definitely know that it's from Tasty. Serving size was big and can be shared by two. The dumplings were meaty and juicy. Tasted way better than Fu Chi Dumplings'. D enjoying his bowl of noodles. We find the noodles bland though. It was just plain noodles and you could actually taste the dough. For just 200 pesos, one could already have a satisfying meal from Tasty. 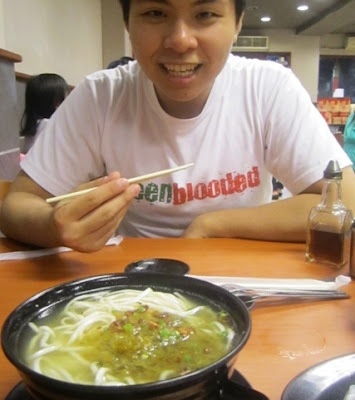 Tasty Dumplings is truly a place worth visiting especially if you want to try a different version of porkchop.